An immediate return match after a tough loss can be a risky proposition. There is no physical reason for this; after a few weeks the body repairs itself and the welts and bruises fade away. But psychologically, the challenge may prove insurmountable; the wounds to a boxer’s confidence can take much longer to heal. Though the ego is soothed by the reassurances of trainers, handlers, and sundry members of the retinue, and though the boxer may tell himself that next time will be different, there’s no escaping the fact that when that time comes, the conquered pugilist may be stepping right back into the same situation that humbled him several short months ago. Sort of like visiting the dentist again to get the rest of the fillings done. 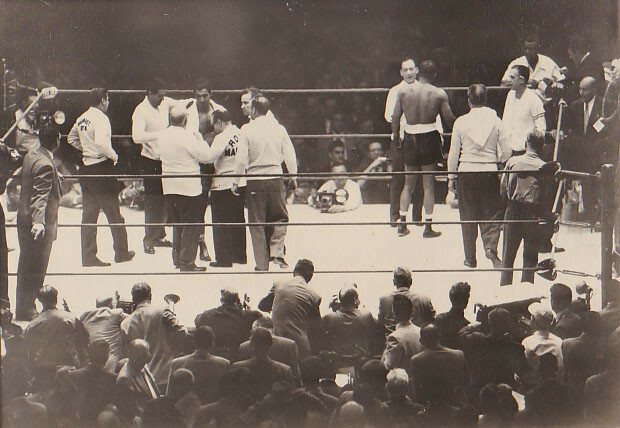 One punch KO: the conclusion of the first Walcott-Marciano battle. 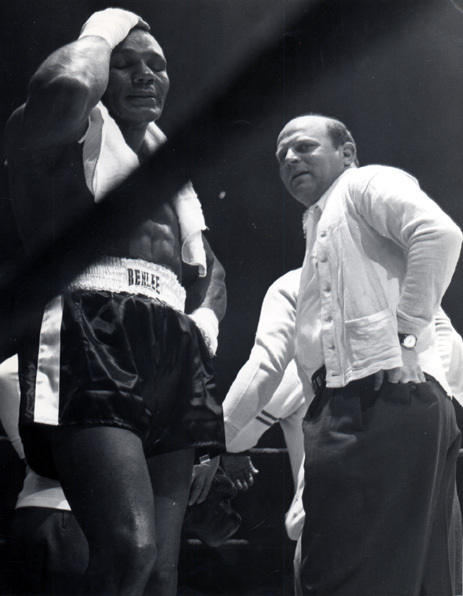 Unless he has devised some new tactics or ring strategy (as for example Sugar Ray Leonard did for his immediate rematch with Roberto Duran), and unless he honestly believes all of the stories he has told himself, all of the rationalizations for his defeat, the rematch can become simply a continuation of the first meeting and the disaster plays itself out all over again. Think Jack Dempsey vs Gene Tunney; Ismael Laguna vs Ken Buchanan; Danny Lopez vs Salvador Sanchez; Ray Mancini vs Livingstone Bramble, or Mike Tyson vs Evander Holyfield. 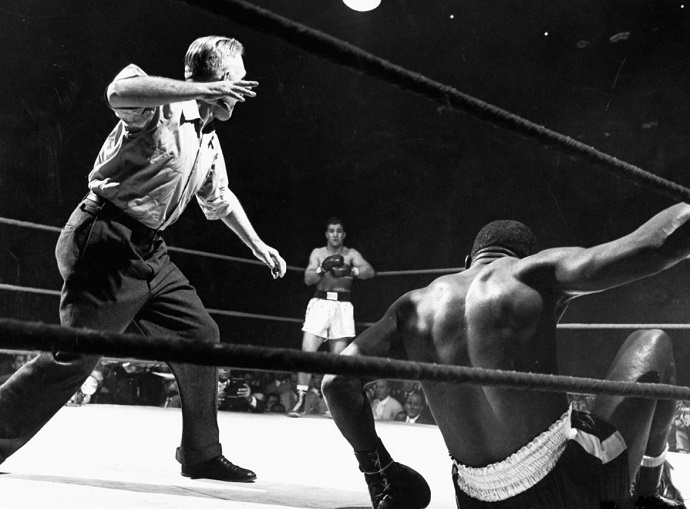 Another excellent example of why it’s often wise for a losing fighter to forego a rematch in favour of a restorative tune-up bout or two, took place on May 15, 1953, when Rocky Marciano defended his world championship for the first time against the man he took it from, Jersey Joe Walcott. Walcott had lost the belt in sudden fashion the previous September in Philadelphia, concluding one of the most thrilling struggles ever for the heavyweight title. He had been well ahead on points when, early in the thirteenth round, Rocky decided matters with a single crushing right hand. The vicious blow was perfectly timed and perfectly thrown and just about removed Walcott’s head from his shoulders. If he’d wanted to, the referee could have counted to a hundred over the crumpled form of Jersey Joe. Rocky Marciano was the new heavyweight champion of the world. The rematch took place in Chicago and anticipation was high. 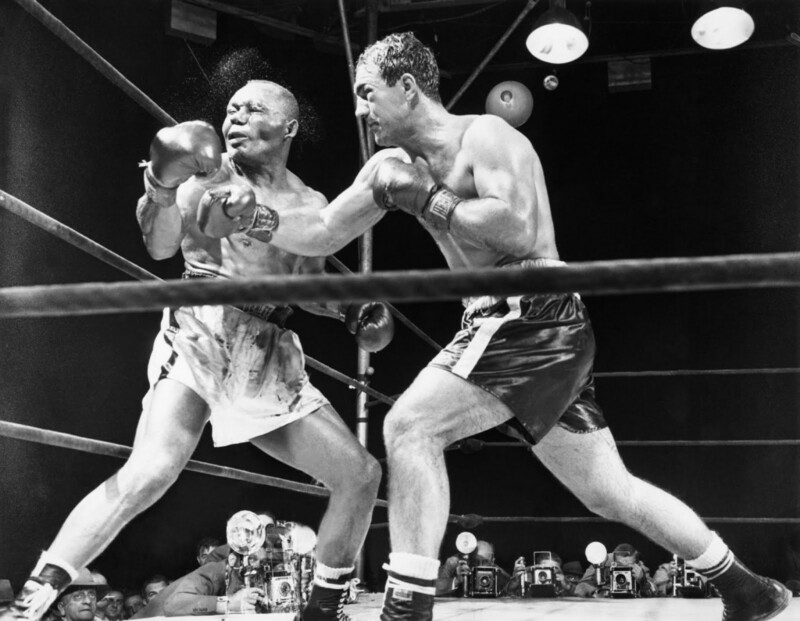 After all, Marciano vs Walcott I had been a titanic struggle, one of the most bruising and dramatic action bouts in years, and the public perception of Rocky was still uncertain. Many in the fight crowd were unconvinced that this relatively small and rather crude banger possessed the skill to be a top-shelf champion. Walcott remained the more proven commodity, a cagey and crafty ring veteran, despite his advanced years. The referee tolls the final seconds of the brief bout. But neither size, nor skill, nor age were the determining factors in this rematch. Instead, confidence was. Because, as everyone would quickly find out, Walcott’s had yet to recover from that devastating right hand clout six-and-a-half months earlier. 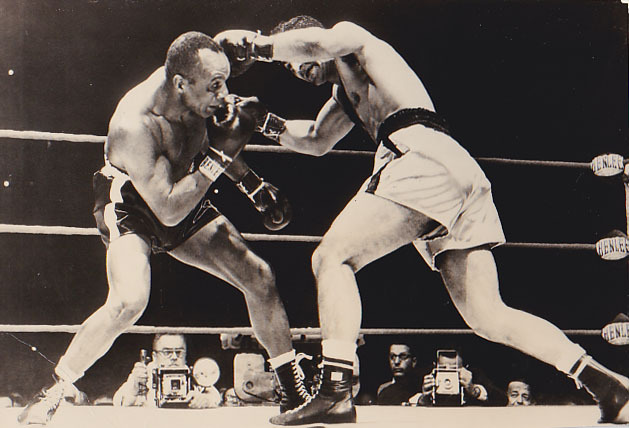 Marciano vs Walcott II was a brief and uneventful affair. For just over two minutes of the first round, the boxers milled about, Marciano lunging behind wild punches and forcing Walcott to sidestep or retreat, the challenger clutching and grabbing as Rocky tried to get to him. Few clean punches had connected when a retreating Jersey Joe set, feinted, and threw a jab to set up a right hand. But before Walcott could follow through with the right, Marciano countered with a wide left hook and then leaped in behind it with a right uppercut that sent the off-balance Walcott sprawling on his back, his feet flying high above him. Walcott and his handlers after the stoppage. The challenger pulled himself up to a sitting position, one hand on the ropes, apparently unhurt. He then chose to sit there, like a man trying to decide if he wants to get out of bed or not, and let the referee count him out. Once the fatal ten was reached, Walcott finally hoisted himself to his feet and promptly assumed the demeanour suitable for a victim of injustice, gesturing and expressing disbelief, strenuously arguing that he was the victim of a fast count, though this was clearly not the case. Instead of a fast count, Walcott was the victim of having been put right back into the ring, before his nerve and fighting spirit could restore themselves, with the same man who had rendered him unconscious with a single vicious blow in Philadelphia. Something more than Joe’s world title had been separated from him that night. 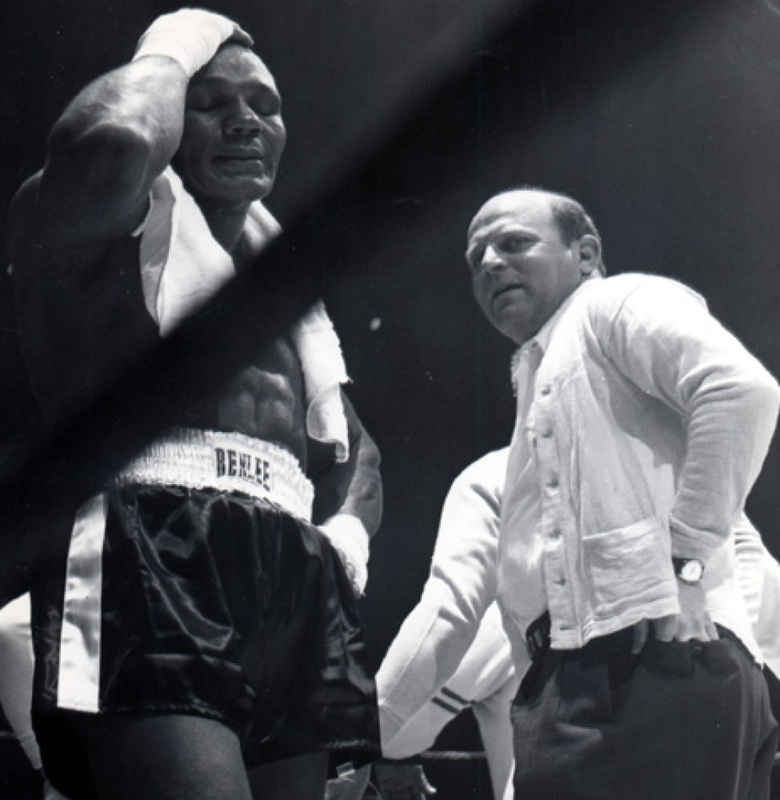 Perhaps in those empty seconds when he sat gazing at nothing as the referee counted off the final moments of the bout, Joe had been contemplating the scattered shards of his broken confidence, still unmended months after that crushing right hand, and now completely shattered. Walcott never fought again.